Paper presented at the 8th International Conference on Oriental Carpets (ICOC) in Philadelphia, November 1996. Appears as a chapter in Oriental Carpet and Textile Studies V, edited by M. Eiland, Jr. and R. Pinner, Conference on Oriental Carpets, Danville, CA 1998. The greatest carpets project a very powerful presence. We analyze various design factors that contribute to this effect. Differentiating space on the smallest perceivable scale creates "life" in a carpet. This is activated through the process of coupling mutually contrasting elements, both in terms of color and geometry. A carpet's large-scale coherence depends on arranging the small-scale elements symmetrically, and defining complex elements that could themselves be decomposed into smaller elements. The same rules apply to all types of carpets, regardless of provenance or age. 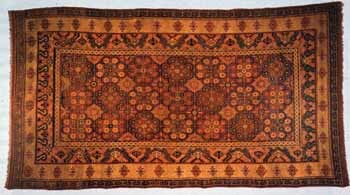 A great carpet from the Alexander or Kirchheim collections (Alexander, 1993; Kirchheim, Franses et al., 1993) transcends its materials and connects with the viewer in much the same way as would another living being. But what is it that gives "life" to a carpet? Lovers of old carpets instinctively know what is beautiful, yet many points in that assessment are only subconscious. The following discussion tries to raise such factors to a conscious level. By codifying the principles underlying the design of carpets, it may eventually be possible to compute the "life" of a carpet as a mathematical coefficient from the design. Specific techniques for giving life to a carpet follow from as yet unpublished material (Alexander, 1998; Salingaros, 1997b; Salingaros, 1999), being a direct outgrowth of Christopher Alexander's theories (Alexander, 1991; Alexander, 1993). 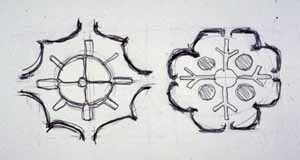 Subelements of a design (called "centers" by Alexander) will cohere together when there is a maximal degree of interaction and overlap. Achieving coherence can be reduced to a problem in maximizing the mathematical symmetries. The same rules apply to all types of carpets, regardless of provenance, age, or materials. These results can help new carpets recreate the life found in the best of the old carpets. In order to grasp this highly complex process, we have to identify the different spatial scales in a design: from the very small scales near the knot size, through all the intermediate scales, up to the overall size of the piece. A carpet, like any design, works on several different levels at once, posing a well-defined problem in hierarchical ordering (Salingaros, 1997a). 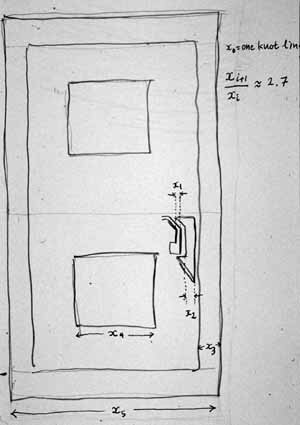 The small scale is defined by contrasts, directional forces, and alternation. The large scale requires relationships, harmony, and balance, and depends on matching similar patterns and shapes to tie the whole together (Salingaros, 1994). Before discussing specific results, it is advisable to clarify in what way the word "life" is used, and how it relates to biological life. Art historical discussions contain almost none of the results that Christopher Alexander has derived. There is no explanation of why a design can come close to mimicking biological life without copying an explicit organic form (Salingaros, 1994). Older treatises on Aesthetics (now discarded as unfashionable) do contain techniques that organize matter together. A reader, however, cannot extract general rules such as ours from those texts. We are only now beginning to understand the structural basis behind complex biological and inorganic forms, through the scientific theory of complexity. The fundamental principles are universal: the same rules apply to architecture, to carpets, and to computer programs. All these disciplines obey similar organizational rules. If the same rules apply to a man-made object such as a carpet, as to an organic form, then one may be justified in using the word "life" to denote whatever qualities one finds in common. A scientific theory such as this has predictive value. For example, the human mind, when left to itself, will choose a scaling ratio that is close to the base of natural logarithms, e = 2.718. When the hierarchy of scales in great carpets is measured, the correlation is astonishing. This is the essence of the scientific method: one develops a theory, based either on observations, or some broad unifying principle, and then makes predictions. If these succeed, the theory is validated. Even a crude theory will eventually be revised to become more accurate. The life of a carpet originates in its details, and is established through connections. The idea comes from basic building blocks in physics. Matter is built out of pairs of elements with the opposite characteristics, bound to each other by strong forces on the microscopic scale (Salingaros, 1995). Whether we look at atomic nuclei, individual atoms, or crystal lattices, all matter obeys this rule on the smallest scale. Opposite elements lock together in pairs; they will actually neutralize if they are allowed to merge. Nature keeps them separated, yet next to each other in a dynamic tension. The same principle activates a design. The coupling of balanced opposites brings a carpet to life. In some parts of a design, space must be differentiated at the smallest perceivable scale - the smallest size the eye can see - to define nodes of interest. For a carpet, that will be a line with a one-knot width, and elements the size of a few knots. Separation in either color or geometry generates a certain tension, a vibrancy, which is felt as the underlying life of a design (Figure 1). The local tensions, arranged carefully, will reinforce each other to form a coherent whole. Figure 1. The local coupling of opposite design elements is illustrated in this 19th Century Kazak. The pairing of opposites on larger scales is a key in the design of the most impressive carpets. Every element, on every scale, must be paired to some element of roughly the same size and opposite characteristics. If there are two distinct types of field elements, they should be complementary opposites (Figure 2). A detailed element should contrast with a plainer element, often seen as merely an empty space; yet the best weavers shape that space so that it has its own coherence, and reinforces the adjoining elements (Alexander, 1993). Figure 2. 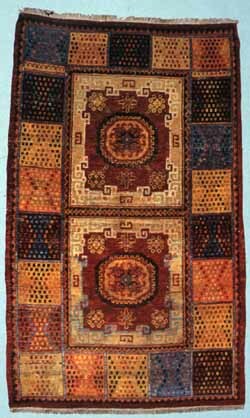 Complementary field elements of the same size are shown in a Khotan Rug, Eastern Turkestan, 19th Century. Opposite color qualities are juxtaposed in two different ways, creating tension in terms of color. Color value. Contrast in gray scale value is independent of the color hue. An element stands out if it contrasts with its surroundings (dark next to light). Often, a darker or lighter outline is effective. Abrash - whether intentional, or the result of natural fading - is an example of a local contrast that makes a field color alive. The color values become obvious either in a black-and-white photograph, or by squinting so that the color hues diminish (Figure 3). Color hue. The effect created by color hues is probably the overriding quality in a carpet, satisfying a fundamental emotional need for humans. A carpet's "life" is based on its materials and dyes, demanding colors that are by themselves intense and interesting enough to connect to the viewer. The color hue must be appealing down to the single knots. This is the secret of the great dyers of the past. As shown by the Impressionist painters, the perception of color is intensified by the juxtaposition of opposite color hues (anticipated much earlier in carpets). Design elements should try to distinguish themselves by having an opposite color hue from their background. Figure 3. An octagonal medallion rug, Anatolia, 16th Century, illustrates separation and contrast in terms of color value. Employing muted pastel colors to suggest an overall harmony usually diminishes a design. The desire to tone down vibrant colors caused some carpets to be destroyed by bleaching. The same ingredients that give life to a carpet make it harsh when they are unbalanced. Great carpets manage to achieve harmony by using the most striking local contrasts and richest colors. This is true when they are new and have bright colors, and many retain their original intensity today. If the colors fade naturally, the unity is usually preserved. The point is that harmony cannot be achieved at the expense of local contrast, because the life of a carpet is thereby lost. Mameluke carpets use contrast in color hue to great effect, without much contrast in color value. At the other extreme, Turkoman rugs use contrast in color value with very narrow changes in color hue. Both work. While the simplest method for bringing a color to life is to use its opposite (i.e., red next to green), this is by no means the only way. More sophisticated results depend on a three-way separation of gray - that is, the balanced use of three colors that would together mix as a gray. This produces the vibration seen in many good carpets. It is necessary to differentiate space in terms of the geometry in order to create life. The aim is not actually to separate in the sense of isolating; it is to intensify the original area by dividing it up, then tying it together more intimately. This is illustrated by the old story of a bundle of thin sticks being stronger than a single thick stick - the modern principle behind fiberglass. An empty space is neutral, whereas small-scale differentiations establish connections between every internal part. We discuss two ways of dividing space. Figure 4. Separation in terms of the geometry occurs in the interlocking border of a Yarkand rug, East Turkestan, 18th Century. Complementary shapes. A line separates a plane into two areas that touch. An undulating curve couples convex regions to concave regions of roughly the same size - the more inflections, the stronger the connection. 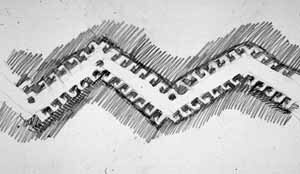 The best is when two complementary halves interlock, as in great border designs (Figure 4). The same principle governs the setting of a field element: the background should have a perceivable shape, just as the element does, and the two shapes ought to be complementary (the ancient Yin-Yang concept). In a good carpet, every element is supported by its background, so there are no left-over spaces (Alexander, 1993). Directional balance. Angles define a sense of direction in a purely visual sense. We can separate an initially neutral region into angles in a way that all the newly-created latent forces are organized. Opposite forces are either balanced collinearly, or are paired into couples. This leads to X-shapes and diamonds for forces along a line; and Z-shapes for forces along different lines. The design is alive when there exist dynamic tensions, where the forces in one direction are complemented by an equal number of forces in the opposite direction. These forces create zig-zags, hooks, and paired triangles (Figure 5). Figure 5. 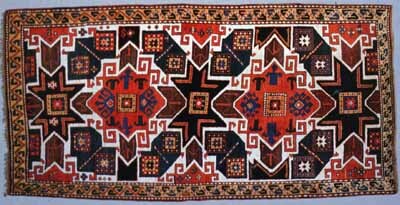 Balanced directional forces generated by angles are shown in a Star Kazak, Southwestern Caucasus, 19th Century. The sense of movement created by a sharp angle is due to the gradient effect, which denotes the change of a quantity in a certain direction. An angle represents an element's diminishing size perpendicular to the direction of the angle's closure. Though superficially distinct, the same effect is created by a gradation of color, or a series of nested similar shapes of diminishing size. Local gradients in the design must be balanced by other gradients in the opposite direction. A carpet with many balanced gradients achieves an overall tension that is interpreted as one quality of "life". Differentiating space using color and geometry gives birth to the smallest elements (the elementary "centers" in Alexander's terminology) (Alexander, 1991; Alexander, 1993). The small-scale structure generates complexity, which is organized by tying everything together through symmetries - this is the process that leads to life. As in biological systems, the key is to organize the complexity generated by the smaller elements, without reducing it. The degree of life is proportional to both the number of nodes, and to the number of symmetries (Salingaros, 1997b). Something that is simple is also symmetric, so the smallest building blocks should be symmetric. More complex shapes are going to be built from these, so we don't want the smallest elements to be complex themselves. We are left with a choice of elementary forms, such as triangles, diamonds, and squares, and their symmetric combinations. The smallest elements may exist separated, as in many tribal weavings made up of small elements in the field, or combined in sophisticated ways into larger wholes of increasing complexity. A large space can be filled with small-scale elements by repeating them in an orderly or disorderly fashion. One consequence of differentiating space in the way described earlier is that contrasting elements will occur in pairs. If they are ordered, repeating elements will alternate, and this is seen in most carpets. Life in a repeating pattern is generated by alternation in both color and geometry. Two complementary elements alternate in a repetition, which multiplies the local contrasts through translational symmetry. A carpet need not consist entirely of local contrasts and repetitions. Contrast on the intermediate and large scales rules out a busy pattern with overall small-scale elements. Large-scale contrast can occur only if there are plainer areas to balance those areas of very intense activity. A large area will couple with an area of comparable size but opposite characteristics, and so intense detail has to contrast with calm. 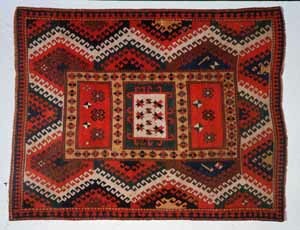 A familiar example is the complex organized border of a Talish carpet contrasting with its plain field - the border is always about the same size as the field itself. Every larger scale in design is defined through symmetries on all its different sub scales. The goal is to connect all points of the design through translational, rotational, reflectional, and scaling symmetries. The human mind perceives obvious symmetries - such as uniform scaling - instantly. 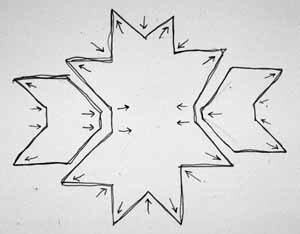 More complex symmetries include conformal transformations, which describe stretching a design in one or more directions. The recognition of these in "uneven" village rugs provides intellectual interest and delight, as long as they are not overdone. An intermediate scale element is either a combination of smaller elements, or it is an entirely new structure, whose details define smaller elements by themselves. Some carpets employ smaller elements as combinatorial units to create the intermediate and larger scales - there are no larger elements, only larger symmetries. In other carpets, totally new forms arise as one progresses to larger scales, yet each larger element could be envisioned as being fused together from many smaller elements. Here, the smaller components are not distinguished (Figure 6). Figure 6. 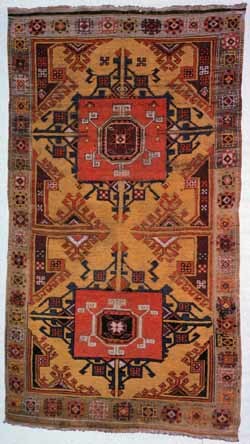 The niche of a "Transylvanian" Carpet, Western Anatolia, 17th Century, is decomposed into several overlapping design elements. A curvilinear design is successful to the extent that its details and symmetries are also well-defined. The "life" in a carpet without obvious details comes from its large-scale harmony. All of its elements must collaborate perfectly, while not drawing attention to themselves. The large-scale structure is supported by symmetries and connections on all scales, though many of these are not distinguishable - they are virtual components of larger forms. A great carpet with predominantly large-scale order (as for example the 16th Century Berlin saph on the cover of HALI 71 (1993)) depends on perfect balance between a large number of virtual elements. A carpet with different forms on many scales has to link them together through similarity and alignment. Separated elements can have an obvious similarity of form or color, whether they are the same or different sizes. Special care is taken to relate the elements in a border to those in the field. An advanced technique is to scale an element up in size, then superimpose a totally distinct internal structure. The eye will still connect such elements because of their common symmetry, even though the similarity is not obvious. A repeating element, or similar elements of the same size, will define a particular scale. Elements must be sharply defined for this to happen. A hierarchical relationship between the different scales relates a design to the structure of biological forms (Salingaros, 1997a). The scales themselves have to be clearly separated - not too close, and not too far apart in size (Alexander, 1998; Salingaros, 1995; Salingaros, 1999). The exponential constant e = 2.7 is proposed as an approximate working ratio between consecutive scales. The size of individual elements should increase roughly by a factor of 2 to 3. A factor of 1.5 is too small, whereas a factor of 7 is too large (Alexander, 1998). Some carpets with a deceptively simple repetition turn out, on closer inspection, to satisfy the scaling hierarchy through a sophisticated technique of multiple alternation. A basic element repeats, but its copies are not identical: subtle differences link alternate elements together. Thus, a group of elements - with size between 2 and 3 times the smaller element - also repeats, and defines a new scale. Although the discrete scaling hierarchy is one of the most important components of design, it is noticed only subconsciously. One needs to measure all the different elements in a design, and to see if they cluster into regular groups according to size. The clusters must define separated scales of the hierarchy (Salingaros, 1994; Salingaros, 1997a). There will be coincident scales of the same size, generated by contrasting elements. One should then check that the ratio between consecutive scales is not very different from 2.7 (Figure 7). Any departure from this will be perceived as unnatural, thus diminishing a carpet's life. Figure 7. The scaling hierarchy is illustrated in a Konya two-medallion carpet, 17th Century. We see five distinct levels of scale, with the same ratio approximately equal to 2.7 between successive scales. The scaling hierarchy is responsible for the most remarkable feature of a good carpet. Looking at any detail connects the viewer with a region on the size of a few knots; this then connects laterally with all similar and contrasting elements on the same scale, which are further connected vertically via the hierarchy onto all the successively higher scales. If the hierarchy works, a viewer will instantly connect to the whole carpet by picking any detail. Conversely, viewing the whole carpet connects a viewer to all one-knot details, if they are defined in the right way. 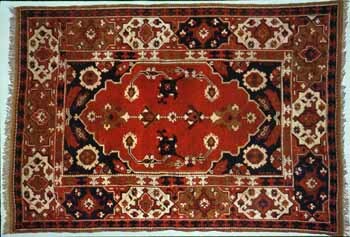 The points raised in this paper are collected in the following list, which should help in deciding on the merits of a carpet design, irrespective of provenance or date. Other, independent factors such as age, popularity, scarcity, and condition play a deciding role in determining the actual value of a carpet. Even though what is listed was originally part of the carpet-weaving tradition, it is argued in the final section that nothing can be taken for granted today. This list is meant to be helpful, and is certainly not exhaustive. Does the carpet use a one-knot detail? If not, then it might work on some larger scale, but the smallest scale is being wasted. Are the individual colors interesting in themselves, and are they juxtaposed so as to enhance each other? Are the smallest elements defined sharply by using contrast in both color hue and gray scale value? Is every element coupled to a contrasting element of the same size that has complementary qualities? Do intermediate and larger elements show the maximum number of internal sub symmetries? Is every internally complex element balanced by a plainer surrounding space that itself has a coherent shape? Is a random spacing of similar elements balanced by a regular, highly-structured region of about the same size ? Do elements and interposed spaces of all sizes link to each other through similarity, symmetry, and scaling? Do different elements have sizes that define a discrete hierarchy with ratio approximately 2.7 between consecutive levels? There is some overlap in the rules. For example, numbers 5 and 7 together help to prevent an overall busyness in the design, by introducing a balance between plain and complex elements. This leads to a coupling in terms of opposite values of complexity, just as numbers 3 and 5 together lead to a coupling in terms of complementary shapes and colors. Both types of coupling can provide the essential rhythmic or "breathing" quality of a good carpet. It is not necessary to follow all of these rules rigidly; indeed, some great carpets intentionally relax one of them. Nevertheless, those were created by master weavers who knew exactly what they were doing, whereas later weavers lost touch with that tradition. The above list is not complete, and represents a minimal set. The closer one wishes to approach the great carpets of the past, the deeper one must delve into the mathematical processes behind organized complexity. Just as there is a world of difference between an ugly contemporary rug and a well-loved 19th century one, there is even more between those and a Seljuk carpet. The point we wish to make here is that all successful carpets satisfy at least nine of the above ten rules. This provides a common ground for understanding what makes a carpet "work", and also why some carpets with otherwise appealing qualities don't. Further research in this direction is likely to lead to quantitative estimates of how well each of the ten rules is satisfied. This would then allow a comparison between carpets, based on a purely mathematical measure. In a poor carpet, the smallest elements are not symmetric, and appear as smudges in the design, having been copied from some better carpet and distorted in the process. They are not well differentiated in terms of color, being the wrong size for the knots and pile. In scaling an element up or down in size from another carpet, one needs to redefine its shape, outline, and internal symmetries so as to make it coherent at the new scale. In addition, many carpets are internally dismembered: individual elements, which themselves may be either well or poorly defined, are left disconnected, not relating to each other or to the whole (Salingaros, 1994). The role of randomness is probably the most misunderstood component in carpet design. Random colors and arrangements break both the hierarchy and the local symmetries, while their interaction generates higher harmonics that define smaller scales. Just like optical illusions, random spacings interfere in the visual field to create a wealth of virtual patterns on many smaller scales. This process is of more use on the small scales, where the spacing between scales is narrow. Randomness can alternatively be used to define a larger scale by coupling with ordered elements. This is an excellent but difficult method for extending the scaling hierarchy downwards. One can start on a large or intermediate scale, and use abrash or floating elements to generate an accidental hierarchy in a monochromatic field. (By contrast, a perfectly uniform field color has no internal hierarchy). A random arrangement of elements must still fit into the scaling hierarchy. The only way to do this is with a wide, highly-structured border, which will couple with the random region to define an element of about twice the size as either the region or its border. Figure 8. The balance between randomness and order is shown in a Khotan two-medallion carpet, East Turkestan, 18th Century. 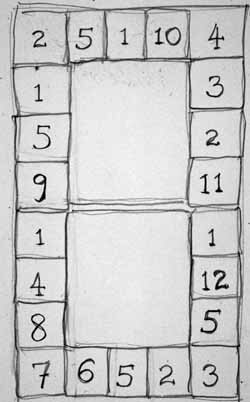 Twelve different border elements are arranged in a random ordering. A random color distribution, or the random spacing of equal-size elements, works very well when balanced by a regular field or border (Figure 8). A symmetric grid that has random colors - where each color is the same size and shape - is successful. On the other hand, randomness in size or shape reduces life by violating both the mathematical symmetry and the scaling hierarchy. In the case of abrash, variations in color may be randomly distributed in position, yet still respect the hierarchy and have translational symmetry. Abrash in poor carpets, by not using random spacings of controlled variation in hues, results in unsightly patches. New carpets consistently violate the ten points given in the above checklist. While this is the result of weavers making careless mistakes, it reflects something far more profound that needs to be discussed. A carpet was, for many centuries, an essentially religious object (Alexander, 1993; Eskenazi, 1994; Kirchheim, Franses et al., 1993). During that time, man tried to mimic his own creator by capturing a certain life in inanimate matter: the results are seen in carpets, religious statues, and buildings. It is only in our time that carpets became secular, i.e., decorative. There is no longer any incentive to mimic life in objects since our society rejects the idea. Carpets incorporate ancient design traditions whose goal is to create life - the same rules were used to build the great temples. Contemporary buildings, however, are based on the opposite rules from Classical, Byzantine, Islamic, and Far-Eastern architectures (Salingaros, 1995). Modernist and post-modernist design rules intentionally violate the organized complexity characteristic of all natural and living forms (Alexander, 1998; Salingaros, 1995; Salingaros, 1997b; Salingaros, 1999). The deterioration of carpet design started long ago, before any influence from contemporary design or architecture. The problem is that, in order to reintroduce life in man-made objects, we have to fight against the design rules taught in our schools. Our society promotes the artificial and rejects the natural. This approach eschews differentiations of color and geometry. We have been conditioned to prefer a dead gray to rich, spiritual colors; to accept the unnatural machine aesthetic of reflective metal surfaces, and turn away from sensuous textures. Uniformity loses the contrasts that define the basic units. Without the interplay of color and geometry on the small scales, life cannot be generated. In addition, simplistic machine precision has replaced the incredibly complex structural precision of biological forms. 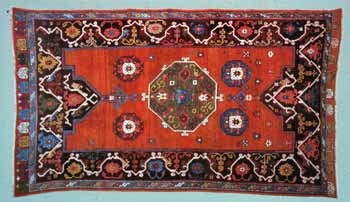 Older, successful village rugs have a relaxed freedom, but pay strict attention to the connections. Carpet lovers who also like contemporary design have to maintain two opposite aesthetics in separate parts of their consciousness. This is terribly frustrating, and most people have not caught on to the fundamental incompatibility. Some prefer Gabbeh carpets because they believe them (incorrectly) to reflect a plain modernist aesthetic. That is a misconception, however, since all carpets come alive from the rules outlined here. The life of even the plainest Gabbeh arises from contrasts such as the speckled non-uniformity of the field; from scaling; and from complex sub symmetries. The "life" of a carpet arises from its elements: how they are defined, and how they are combined. The smallest details in the design should be simple and symmetric, defined by contrasting colors and shapes. Smaller elements are then combined in ways that enhance the more complex elements making up the carpet. The foundation for a good carpet involves maximizing the number of sub symmetries on the large scale. The final product lives only if all the elements, on all scales, are successfully combined into a coherent whole. Applying the rules derived in this paper can make the process of judging a carpet less of a mystery. We can rank-order similar carpets in terms of their degree of "life". This reflects how well their weavers understood what makes a carpet work. Such an ordering is not necessarily chronological, as design elements have continuously evolved and transformed, with varying degrees of success. What matters is how an element fits into and enhances the life of a carpet, not how accurately it is copied from another carpet. The changes necessary to make a design element work in a new and different context drive the transformation of motifs. One may also compare two entirely dissimilar carpets using the same criteria. Hopefully, this approach will help to raise the success rate in new carpet production, which is usually a hit or miss affair. Acknowledgements: I wish to thank Basil Scaljon for his helpful comments and suggestions. John Eskenazi has kindly allowed the use of his carpets for the illustrations. Jill Tilden asked one or two penetrating questions, which are now answered in the revision. Alexander, C. (1991) A New Way of Looking. HALI: The International Magazine of Antique Carpet and Textile Art 56 115-125. Alexander, C. (1993) A Foreshadowing of 21st Century Art. New York: Oxford University Press. Eskenazi, J. (1994) Weaving as Liturgy. HALI: The International Magazine of Antique Carpet and Textile Art 74 81-85. Kirchheim, H., Franses, M., Spuhler, F., Muse, G., Rageth, J. and Herrmann, E. (1993) Orient Stars: A Carpet Collection. Stuttgart & London: E. H. Kirchheim & Hali Publications. Salingaros, N. A. (1994) In Defense of Alexander. HALI: The International Magazine of Antique Carpet and Textile Art 78 67-69. Salingaros, N. A. (1995) The Laws of Architecture from a Physicist's Perspective. Physics Essays 8 638-643. Salingaros, N. A. 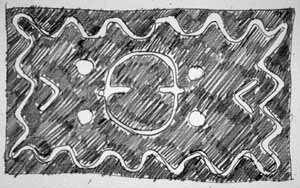 (1997a) Inca Period Textile. HALI: The International Magazine of Antique Carpet and Textile Art 91 164-165. Salingaros, N. A. (1997b) Life and Complexity in Architecture From a Thermodynamic Analogy. Physics Essays 10 165-173. Salingaros, N. A. 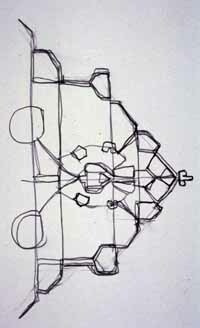 (1999) A Scientific Basis for Creating Architectural Forms. Journal of Architectural and Planning Research 16 (to appear).